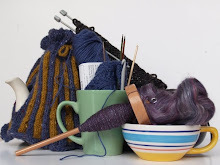 A week or two ago, the world seemed to slow down for a few moments as word went around the small crafting community in Dublin that one of our good friend's husbands had been diagnosed with a serious illness. He was to be in and out of hospital for the foreseeable future, fighting a formidable disease. As you would expect, we all reached out with messages of love and support, but there is little else you can do when you don't live nearby and can't just drop over food and be available to dispense liberal hugs and offers of lifts. In all honesty, I felt useless. I could only imagine how they both felt. A little while after hearing the news, we were all asked not to send Get Well flowers, as they weren't allowed in the ward room. That's when it hit me. We can't send REAL flowers, but boy, could we MAKE a bunch to liven up the room and to remind them both how much support they had behind them. I put out the call (in secret, of course!) and was soon being inundated by blooms. 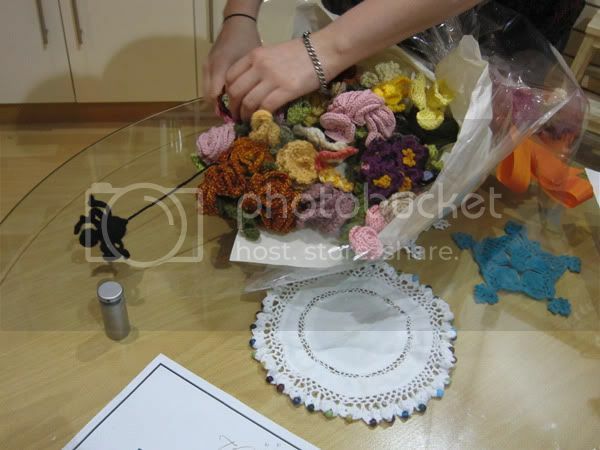 There were tiny knit ones, big crochet ones, leaves, stems, roses, daffodils, carnations, a spider... The list went on and on. 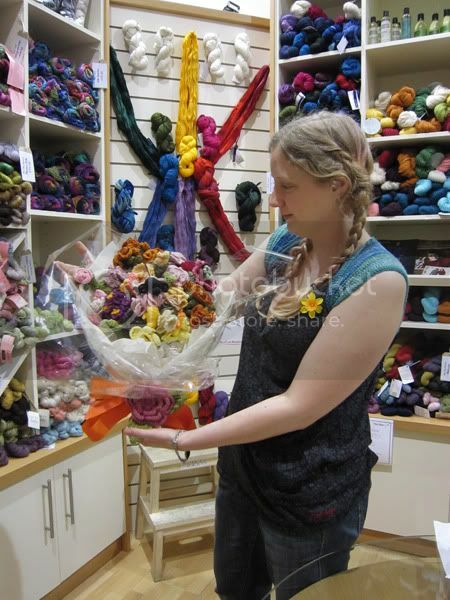 I even discovered that a long-time knitter had learnt to crochet just so she could add more to the bouquet. How great is that? In the end, I gathered them all together, bunched them up in some tissue and cellophane, added the card with many messages of support and love, and handed them over to another friend who was to see it safely to a FFF meet-up which was especially planned around our friend's now super-busy schedule. It really warms my heart to see how many people answered the call, the effort everyone put into making their flowers anatomically correct (seriously... calyxes, stamens and everything! ), and to know the flowers were appreciated. I have been told they now grace the windowsill in the hospital room and are being commented on by many. In light of Daffodil Day being only a few days ago, I'd like anyone who has means, to please click and to give whatever they can to the Irish Cancer Society. Their work is truly invaluable. You made me get all teary. In public. I got a rep to keep up, ya know. Wouldn't have done it for just anyone, petal. These are so very beautiful - good job to all of you involved! Elana,, these are so beautiful and everyone who made this beautiful arrangement, may your god bless you! I am thinking of you, Brendan and your boys and praying for his health.